If you’ve ever had the pleasure of meeting the Tucks you’ll understand why they are considered one of the most elegant couples in the NFL family. They are a study in solidarity, values, and elegance. The couple shared with BE.com, the ways in which some of life’s lessons have impacted their personal financial lives, and influenced their philanthropic goals for our 3 Most Important Lessons About Money series. BE.com: What would you consider the 3 most important lessons you’ve learned about money? Think long-term: build wealth for your retirement, but also for your great-grandchildren. Â How did you learn these lessons? 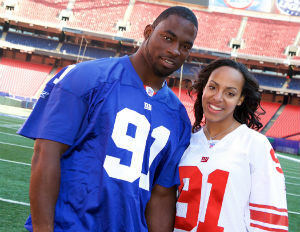 Justin: I learned the ‘keeping up with the Jones’s’ lesson in NFL locker rooms, although it certainly applies beyond it. NFL contracts vary significantly in size and none are fully guaranteed. Additionally, some guys, myself included, have car endorsements, clothing endorsements etc. so trying to buy cars and jewelry to keep up with guys that are borrowing them makes no sense, especially items that depreciate in value. Lauran: I learned about budgeting from my parents. Whenever I made money, by doing chores, babysitting etc., my parents would sit me down and take some of my money away for ‘taxes’ and some for ‘charity’ and some for ‘savings,’ and then I was able to keep what was left. With what was left, I created a budget with short-term and long- term goals. At a young age I began to really learn what it means to be responsible with money and I am forever grateful to my parents for those lessons. What impact have these lessons had on your life today? Lauran: We adhere to a monthly budget and have since Justin was drafted in 2005. That was important because Justin was able to make the decision to retire/transition from professional football without financial pressures. If you had one lesson you could convey to people about money, what would it be? Both: Through our charitable organization, Tuck’s RUSH for Literacy, we help to fund college savings accounts for students in New York and we hope that they begin to learn about banking, budgeting, and asset building. We also believe that it’s important that people make informed decisions based on what money means to them. Some people have the ‘you can’t take it with you’ attitude, and others are very conservative and never splurge on themselves or others; it is important to recognize where you fall in that spectrum and what the consequences of that attitude will be. Being financially literate is about more than understanding compound interest and different investment vehicles.